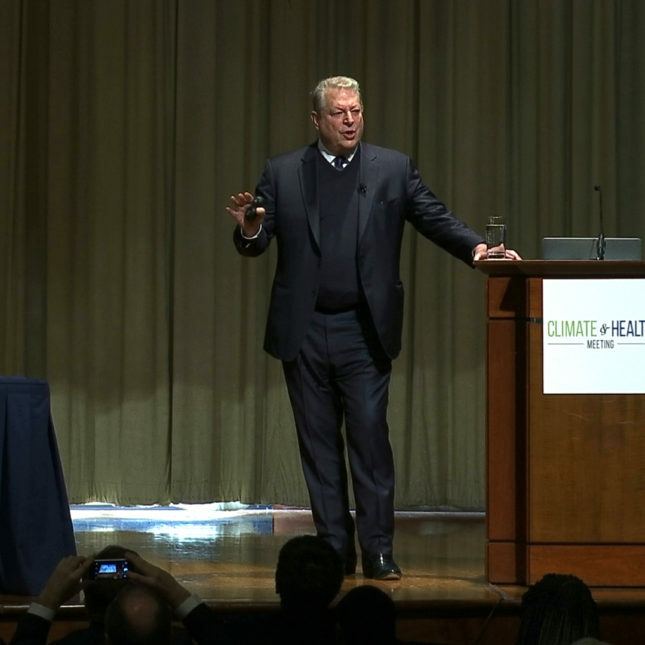 ATLANTA — Organizers of a conference on public health and climate change urged policy experts and policymakers to mobilize in the wake of a new administration they say has denied the impact, and even the existence, of global warming. Three lead organizers behind the Climate & Health Meeting — former Vice President Al Gore, Harvard Global Health Institute’s Dr. Ashish Jha, and the American Public Health Association’s Dr. Georges Benjamin — brought together more than 300 people at the Carter Center in Atlanta for a one-day meeting to replace the three-day conference originally scheduled for this week at the CDC headquarters four miles away. The original meeting was canceled after the presidential election in anticipation of the Trump administration’s unenthusiastic views toward climate change work. But two CDC scientists who played a leading role in the scrapped summit spoke at Thursday’s meeting. So did former President Jimmy Carter. The canceled event cast a shadow over the meeting’s intended message — if we don’t slow climate change, infectious disease, metabolic illness, and other maladies will either become more common or will find themselves in new geographies that were once too cold, or perhaps too dry. Some researchers discussed how health conditions like heart disease and mental illness have climbed, linking them to global warming. Columbia University public health professor Kim Knowlton said rising temperatures have the potential to increase the number of heat-related hospital visits and deaths in cities like New York. Other experts focused on the global effects of climate change including the recent increase in natural disasters and the spread of infectious diseases. Benjamin cut to the point as he urged public health and climate policy experts to act so they would “not be impeded by denial” from skeptics. The CDC staffers who did show up Thursday kept a quiet profile during the meeting. Laura Turner Seydel — an environmentalist who sits on the board of the Turner Foundation, a one of the meeting’s main sponsors — told STAT she believes CDC scientists may be “scared by the wrath of Trump.” He has called climate change a hoax invented by the Chinese. Because of that, she worries researchers like George Luber, an epidemiologist who’s participated in the global warming documentary series, Years of Dangerously Living, might be deterred from speaking further about issues of climate and health. Breysse, the director of the CDC’s National Center for Environmental Health, was one of the original CDC summit organizers before agency officials canceled it. He still participated in the rescheduled event — briefly, though, as he introduced a speaker. Talking to reporters, Benjamin later conceded some of his peers at the CDC “are afraid” about the potential fallout within the agency. But Benjamin said it wouldn’t stop him from reaching out to them in the future to see if they would help raise awareness with the public about the human costs of global warming. As always, follow the money, this time back to the fossil fuels industry. Citizens should be ashamed that they have been tricked into giving their votes to corporate interests by electing those who are essentially lobbyists, who then represent corporations and abandon those of us who put them in office. Congresspersons who prostitute themselves to donor money instead of representing the best interests of citizen voters get away with it because of Citizens United and its ilk. Money out of politics completely, elect on issues only. A Skeptic is someone who demands good evidence in order to adopt a position. A Denier is someone who maintains their position in the face of good evidence. They are literally the opposite of one another. As a skeptic, I am offended by characterizing Deniers as Skeptics. Please stop. Hear, hear….no longer do we have scientists who can hold 2 opposing ideas in their head at the same time…the result being discussion and educational debate.